Discussion in 'Change Log' started by Link_Targaryen, Jun 1, 2018. 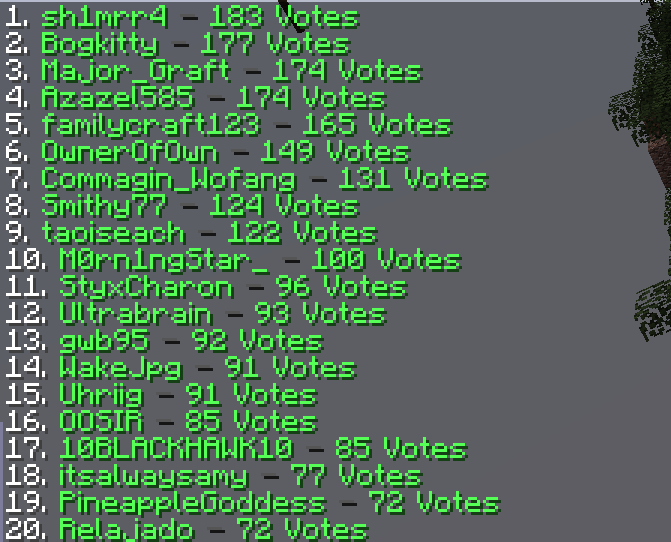 To check your current ranking, go to the Lobby server and type /votetop. This will display the top voters for the months. The donation coupons will be directly messaged to their winners upon the conclusion of the voting contest and will expire two weeks after they have been delivered to the winners. *Admins cannot participate in this voting contest, though their alt accounts may. Link you are the worst human to exist in the Holocene period. Congratulations to all of you! Your prizes will be distributed in the form of a coupon code to our shop via PM on the website or discord. If we cannot find your forums or discord profile to contact you, it will be your responsibility to contact us to retrieve your code. Thanks again for all who participated this month! With myself and Major having the same amount of votes would that be a joint 3rd ? or going in placement order ? Y am i still seeing this.